It’s one thing when the expectedly good turns out as such, but entirely another when the unexpected turns out to be exceedingly good. 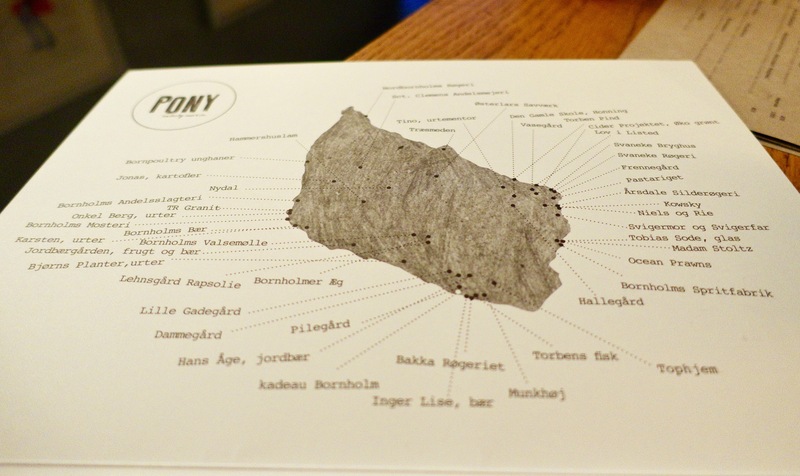 Following a superb dinner at Relæ, the next night, we dined at Pony, a relatively lesser known restaurant in the western part of Copenhagen (Vesterbrogade). 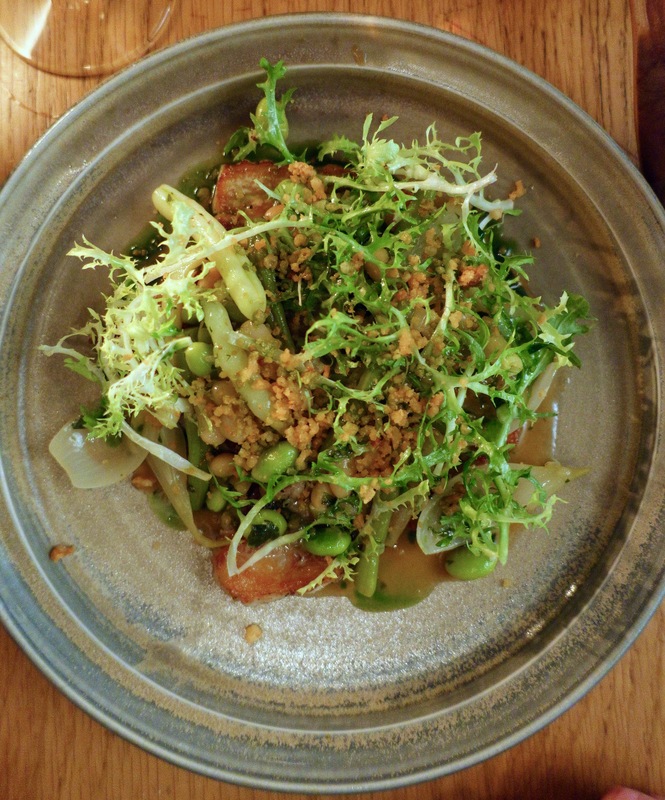 Almost always described as the “younger brother” of famed Michelin-starred restaurant Kadeau, and serving simpler fare, Pony certainly did have a relaxed, neighborhood bistro kind of feel to it. But the food was anything but casual. The composition, execution, presentation, and flavors of each dish throughout the night had been thoughtfully planned out, with the level of refinement we would have expected at any high-end restaurant. 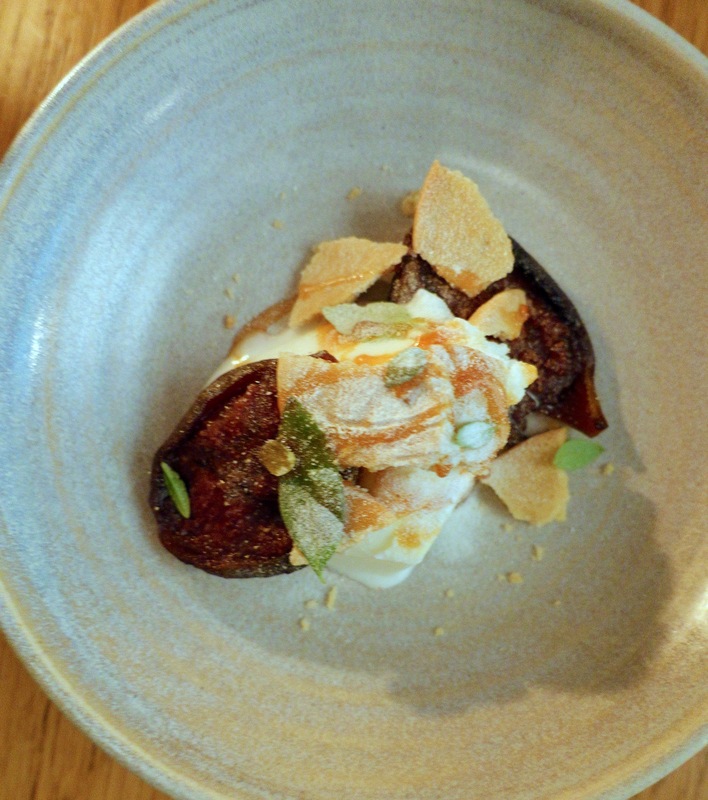 The aspect of the dishes we most enjoyed was the layering of flavors and textures, such that with each bite, elements each having a distinct characteristic, came together wonderfully in a balanced marriage. Like good teamwork, there was a synergy that resulted from the coming together of the individual components. The whole was greater than the sum of its parts. 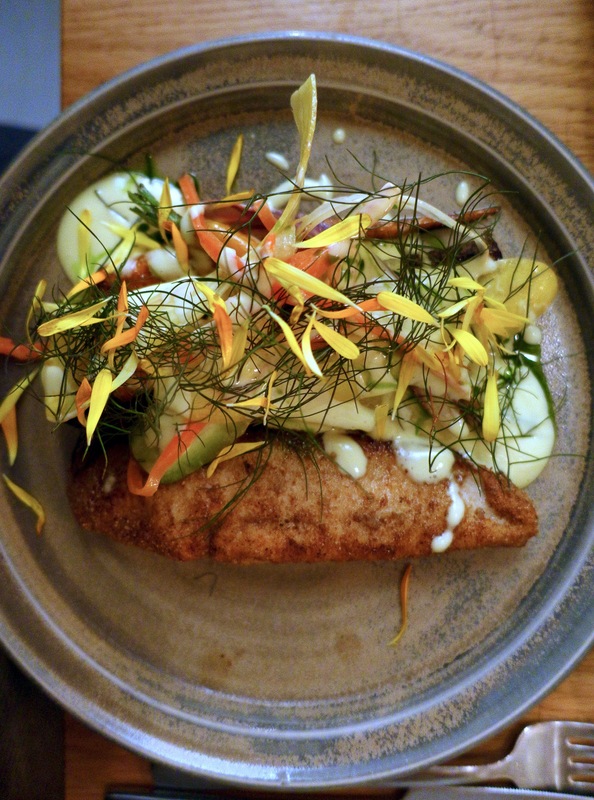 We found the dishes we had to have cohesiveness–based on a central theme of seasonality and use of local ingredients, many of which are from the nearby island of Bornholm. Map of Bornholm Island and producers from whom ingredients are sourced. The lineup for the 4-course tasting menu highlighted late summer fruits and vegetables, and a sneak peek of fall’s offerings including zucchini, ripened dark berries, figs, and yellow and purple carrots. The meats presented, also from Bornholm producers, progressed nicely from light to heavier throughout the sequence of courses. Perhaps signifying the arrival of fall, or simply just the buildup of richness, we appreciated this and all of the other details. Whole grain, oatmeal, yogurt, and beer bread with whipped butter with buttermilk. Quite possibly the best bread and butter combination I have ever encountered. Inherently sweet and malty, the bread was chewy with a crust like none other. Whipped butter was light and easy to spread. Again, subtly sweet and smooth. Warm scallops with zucchini, spinach, toasted hazelnuts and a yogurt sauce. 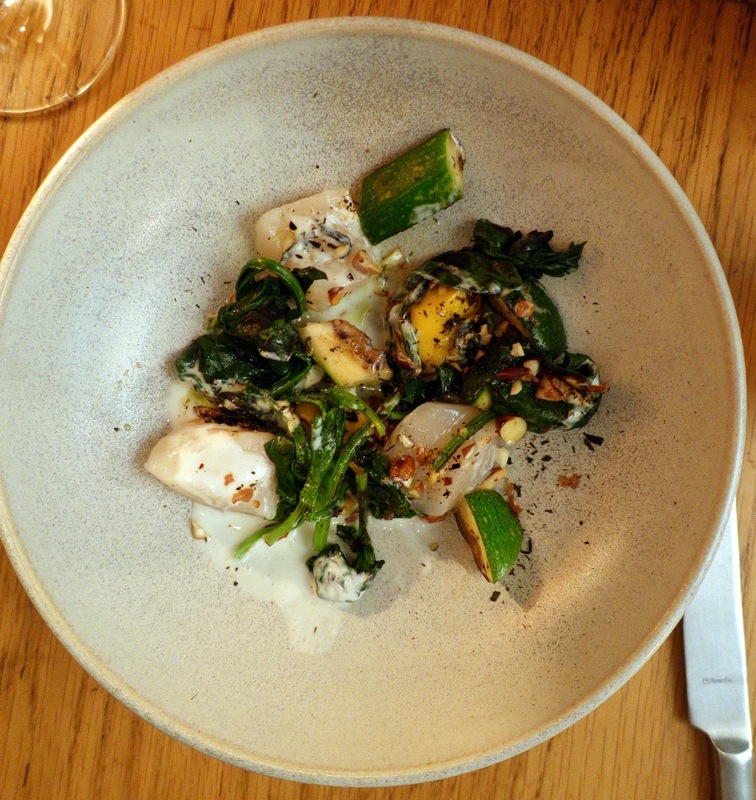 Sweet and buttery scallops were served semi-raw, balanced by the nuttiness and crunch of toasted nuts, and tender summer vegetables. Hot smoked duck breast, seared duck hearts, plum jelly, red currants, and red sorrel. 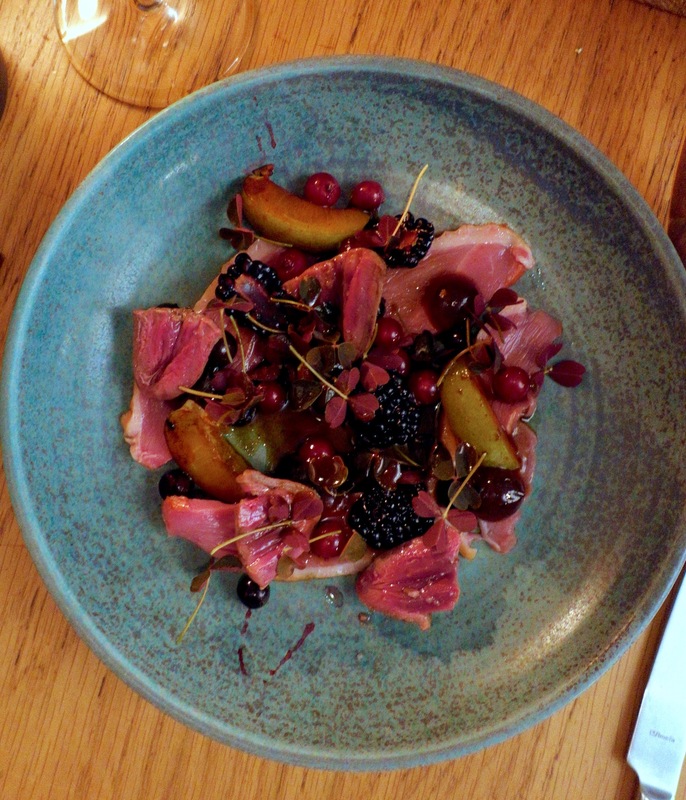 Tart and sweet late summer fruits complemented the smoked duck and hearts. Deep reds and purples made for a dramatic yet whimsical presentation. Seared pork belly with pork jus, green beans and shelled beans, frisée lettuce and bacon crumbles. Another hearty yet light dish in which each of the components was cooked just long enough to release its flavors yet retain its integrity. Pan-seared plaice fish with a mixture of roasted, semi-raw, and pickled carrots, blanquette sauce, dill fronds, and flower petals. Coated in a thin layer of cornmeal and pan fried, the fish retained its juiciness and delicate, natural flavors. The carrots, presented three ways, was a fantastic way to highlight the texture and sweetness of the carrots differently. Roasted figs, lemon sorbet, two kinds of caramels, crumbled shortbread cookie, lemon verbena. Sweet, tangy and buttery, this combination of fruits and herbs was a favorite of the night. Reservations are recommended but not a must. 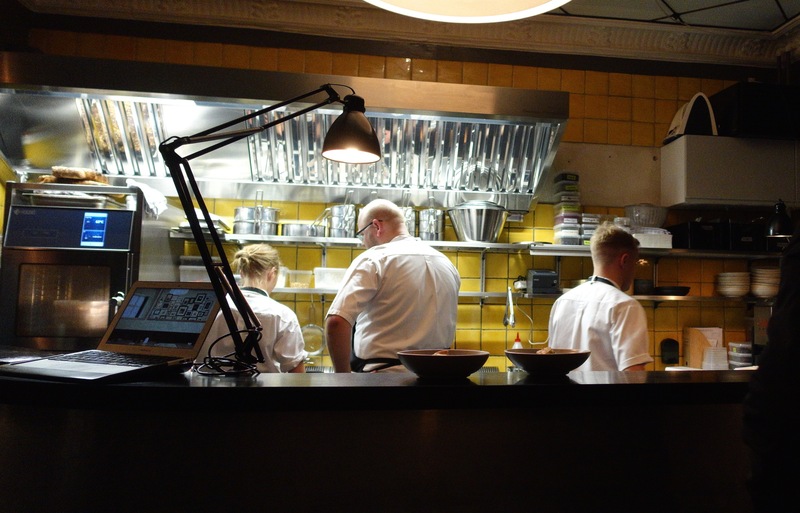 Sit in the front room of the restaurant at one of two high tables and watch the chefs in the open kitchen at work. Or, the rear dining area has several intimate tables.